Check out confirmed details about Group C Teams, Schedule, Predictions for the upcoming 2018 FIFA World Cup in Russia. 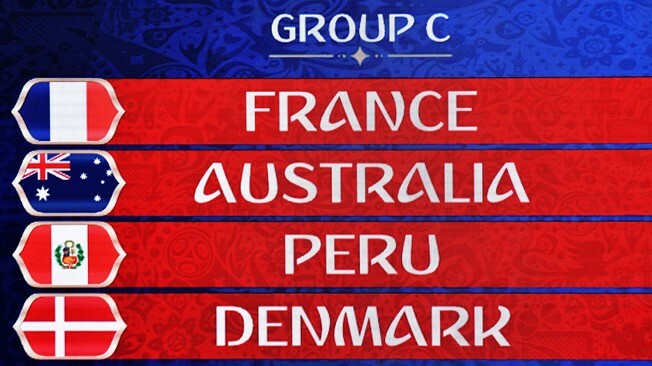 An easy group for 1998 world champions France as they face Australia, Peru and Denmark in the group stage. The duel between two highly fancied European sides will likely be given top billing during the third round of games in Group C.
1998 world champions France will be in high spirit when they began their FIFA world cup campaign. In 2016, they were the runner ups of UEFA European championship. Australia is the defending AFC Asian cup champions. Making their fifth appearance, their best performance was in 2006 when they managed to advance in the round of 16. Australia moved from position number 100 to 38 in three years. Peru will be playing in the world cup after a huge gap of 36 years. Their last appearance was in 1982. One time European champions Denmark will pay in the world cup after missing the chance in 2014. They lost to Brazil in the quarter finals in 1998 which was their best performance ever. France is expected to top the group. They clinched the first position by defeating the odds of Netherlands and Sweden in the qualifying camping. Griezmann and his side definitely have an edge over the other three teams. The Australian Team struggled in the Asian qualification finishing third in the group setting up a clash against Syria. The extra time winner by Tim Cahill sent the Socceroos to the intercontinental play-off which they won against CONCACAF contenders, Honduras. Peru who reached the World Cup after a long wait of 36 years. Peru started off poorly and changed their fates by winning some crunch games against Uruguay and Ecuador. With the help of some other results in the confederations, they got a play-off spot against the Kiwis and they surely didn't disappoint their fans. Denmark came back strong in their qualification campaign with massive wins over Poland and Montenegro but had to settle for the second position due to poor performances earlier. They beat Ireland 5-1 away from home to seal their spot in the World Cup. Denmark has improved magnificently in the past couple of years. It would be a hard fight for the second place finish between Australia, Peru and Denmark. Denmark being the favourite.